CloudOn is a free application that gives Microsoft office tools like Word, Excel, Power point and more for your Android tablet and iPad devices. So you can create and edit your office documents through your tablet. And using CloudOn you can save your documents directly to your Box, Dropbox and Google Drive accounts. And also CloudOn having built-in Adobe Reader and and File Viewer lets you open and view virtually any file type including PDF, JPG, PNG, GIF etc. 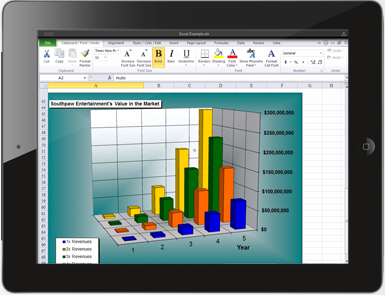 Use Microsoft Word, Excel and PowerPoint on your tablet to create, review and edit documents. View virtually any type of file, including: PDF, JPG, PNG, GIF, etc.